Skipton Amateur Swimming Club. Top row - far left: Harry Hollas (ambulance man), second from left Harry Scott (joiner & cabinet-maker), centre: Mr Jeffries, Baths Manager. Walter Morrison Jowett (standing middle row, far right) was an Old Boy of Ermysted's (1904-1908). 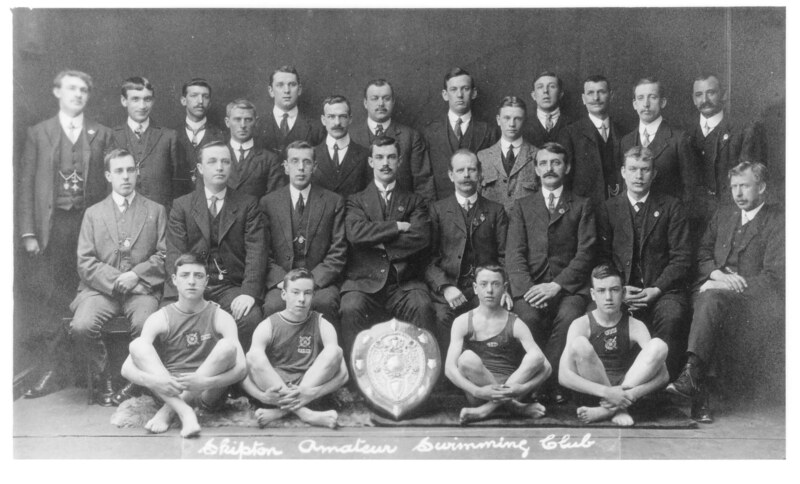 He was - at some stage before 1913 - the secretary of Skipton Swimming Club. His father ran a draper's shop in Skipton; his brother, Priestley, was head boy at Ermysted's and became an officer in the First World War. In 1913 he emigrated to New Zealand, where he took a job sheep farming with his uncle, former Skiptonian William Boothman. In 1915 Walter joined the New Zealand Expeditionary Force as a Rifleman, going out to France in 1916. He was fatally wounded on 15th September 1916 during a British adavnce on Flers, on the Somme. The gentleman in the back row, far right, was Leeming Varley, He lived in the canal cottages a short distance away from the Gas works where he was a foreman, he was later Licencee of The Royal Oak in Water Street. He also taught Boxing . He was my great grandfather. Could it be possible to be put in touch with the relative of Leeming Varley as I am tracing that particular family tree. Harry Scott was my great uncle, being brother to my grandmother Norah (nee Scott) who was married to my Grandad Richard Smith and they lived at 36 Romille Street and have 8 children. The eldest was my Dad (William) followed by Harry, George, Fred and Arthur, then Marion, Doreen and Joan (all Smith of course). My Dad (Bill Smith) married my Mum (Ada -Peggy Boothman) and had me, my sister Heather and brother Robin. My Uncle Harry Scott in the photo second from left back row, was son of John Scott who built the old Skipton outside baths up Shortbank Road. Uncle Harry was also a cabinet maker whose business was opposite the bottom of Christ Church grounds (Church Street?). He made my mother a piano stool with twisted legs and the top opened to hold her piano music.